New Year is here and it’s time to embrace the latest fashion trends. It’s time to revamp your closet, makeup, hair and more. It’s time to welcome the New Year with excitement and follow the upcoming fashion trends. When it comes to fashion, Women have always been following the latest national and international trends. To stay abreast with the latest fashion trends, women follow fashion channels on television, fashion blogs & websites on the internet and fashion magazines to stay fashionable. Fashion is something that keeps on evolving day by day so if one needs to stay fashionable and trendy they need to follow the ever changing world of fashion. 2015 is here and the designers have already started showcasing their latest collections for women’s fashion. Their collection will give you an idea about what upcoming trends in fashion for the spring and summers would look like. In 2014, metallic shades like gold, silver and bronze were in trend. Whether it’s clothes, jewellery, accessories or footwear, the metallic shades have been popular round the world round the year in all the seasons. The beauty of metallic based accessories lies in the fact that they can accentuate your look instantly. Peach colour is another shade that has reigned the fashion scenario for the entire year and will continue to do so in this year too. From peach sports hoe to peach hair clutches, the ladies have tried the peach shade in almost everything. What made peach colour so popular Is hard to comprehend but what’s so special about this shade is that it goes well with almost all skin types especially the Indian skin type which is predominantly brown. Peach can be paired up easily with most of the common shades like black, brown or red which makes it all the more wearable. Inviya is the first brand that manufactures spandex in India. Its headquarters in India is based in New Delhi. It’s a part of Indorama Industries Ltd. which is based in Singapore. 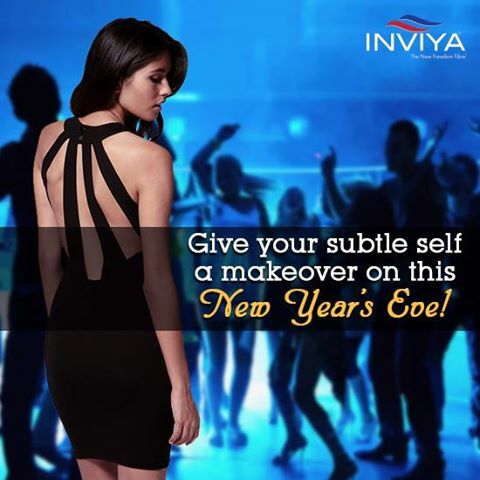 Inviya based outfits will remain in vogue again in 2015. Outfits like jumpsuits, palaazos and maxi dresses remained popular last year and what made them more popular is the level of comfort due to the infused Inviya In these outfits. It provides the right stretch and comfort which is the main requirement of every individual. Outfits made of air covered yarn have just the right amount of stretch. When it comes to freedom it’s a very important need of every individual and clothing that provides you freedom should be the first and foremost priority of every individual. Clothes made of Inviya filament yarn gives the much needed freedom of movement that’s why it’s popular amongst the sportsmen and fitness freaks. Denim will also continue to remain popular and in trend in 2015. Many of you might not know that even denim contains spandex which makes it stretchable and comfortable. Denim outfits are quite popular not only among the youngsters but also among people of all age groups round the world. Its durability and stretchability is owing to the spandex which is an important constituent of denim. Inviya is a brand of spandex which is a highly stretchable fibre and can expand without losing its quality. Spandex is made of air covered yarn and it’s resistant to wear and tear which makes it highly popular for manufacturing clothes. Most elastic yarns are core spun yarn and are stretchable in nature. It’s used to manufacture sportswear, swimwear, intimate wear and active wear due to its elasticity and durability. The costumes for Olympians are also made of Inviya which testifies the fact that it’s one of the best materials for designing stretchable outfits. Denim can be worn by people of all ages in all kind of weathers. Denim wears are popular round the world owing to their versatility. It’s so comfortable and skin-friendly that people like to wear it in all kind of weathers. In summer season, denim wears can reduce the sweating and keep your skin cool. In winters, they will keep your body protected and will provide the much needed warmth. All you need is a pullover and a jeans, and you are all set to enjoy winters. For rainy season, one can go for denim based capris to feel comfortable. Denims are made of spandex which is a synthetic fibre which is the secret behind the durability and stretchability. Spandex is exceptionally elastic and it can make any fabric stretchable and can tolerate wear and tear. Spandex is one of the textile raw material that is used to manufacture denim in factories. Inviya is India’s first spandex filament yarn facility. Inviya has gained popularity among the Indian cloth manufacturers as it provides them spandex fibre locally. When it comes to stretchabiilty and durability, spandex fibre is unbeatable. People of all ages from kids to grandparents like wearing denim wears. Denim wears looks good on everyone irrespective of their age, shape and size. It’s just perfect for everyone. Even toddlers like wearing denim based capris, dungarees, jeans, skirts and tops. They find it comfortable and since it’s skin-friendly it’s more widely used. For college goers, denim based skirts, tops, jeans and jackets are especially popular. Denim dungarees are worn by both girl and boys. Out of all the denim wears, jeans are the most popular one and it has been ruling the fashion world from years. When it comes to denim wears, the list is endless. Denim Is not only used to design clothes but nowadays it’s used to design bags, belts, shoes and hats. Denim based accessories look funky and can make any plain outfit look stylish. Denim based accessories are especially used by youngsters who like to try different kind of looks. Even big fashion houses manufacture denim based accessories like belts, bags, hats and shoes. You can get denim accessories at affordable rates also in street shops. So, go ahead and pair your outfit with a funky denim outfits. Coloured denim wears have become fashionable in the last few years. Coloured denim jeans look very vibrant and it’s an ideal outfit for uplifting your mood. Red, green, yellow, just think about your favourite colour and you will surely find a jeans in that shade. You can pair a plan shirt or a t-shirt with your coloured jeans and you are ready for a casual outing. When it comes to stretch and durability, coloured jeans are as good as the traditional blue jeans. Coloured denim based wallets look really cool and can accentuate any plain outfit. In India, denim wear is used widely and people of all age and status wear denims. Denim wear is quite affordable and long lasting so people don’t think twice before going for it. And denim is ideal for India as we have a diverse kind of weather here which makes it difficult to wear all kind of clothes. Denim wear which is suitable for both hot sultry summers and cold winters is suitable for India. Youngsters are a big fan of denim wears and they like it mainly because of its stretchability and durability. Denim wear is rugged in nature and can stand wear and tear even after rough usage owing to the textile raw material spandex. Inviya which is the first filament yarn manufacturer in India is the first choice of Indian designers who design denim based designer wear. We all have been waiting for the summer torture to come to an end, and it finally has. After the scorching three months of summer, monsoon was the only thing I could ask for! Now that monsoon is here, I, like million others have started to fret over it. The incessant spells of rain, the mud, the humidity, and above all, what to wear because each outing these days is nothing short of a battle wherein I have to fight puddles, mud, rain, and of course vehicles who without any compassion splash muddy water on your clothes and speed past you, just like that! I am often confused thinking what to wear in such weather. Even if I want to try something fashionable, I find it difficult when it comes to maintaining it for stretch of hours. Moreover, the dull and murky weather condition makes it even more difficult to choose a proper outfit be it for a casual outing or for a party. Most of the times, it becomes a challenge to remove the mud stains on our clothes which is either the result of any running car or any running kid. I have seen, that rayon or silk fabric usually comes to rescue in such a case as it is easier to get rid of the stains from them. Spandex fiber made out of inviya core spun yarn also has this quality. So, choose your fiber right before stepping out! One of the easiest ways to combat monsoon in a stylish way is by wearing shorts and skirts. Their short length is the biggest advantage – keeping you tension free from getting your jeans or trouser stained by the puddles. You can team up shorts with loose fitted tees or tank tops. Both look extremely trendy and cool. Although I understand, it is not always feasible to wear a pair of shorts to every place we go, and hence, I would say, denims will always be a girl’s best friend. They might get spoiled for the time being but they will give you the much needed comfort. 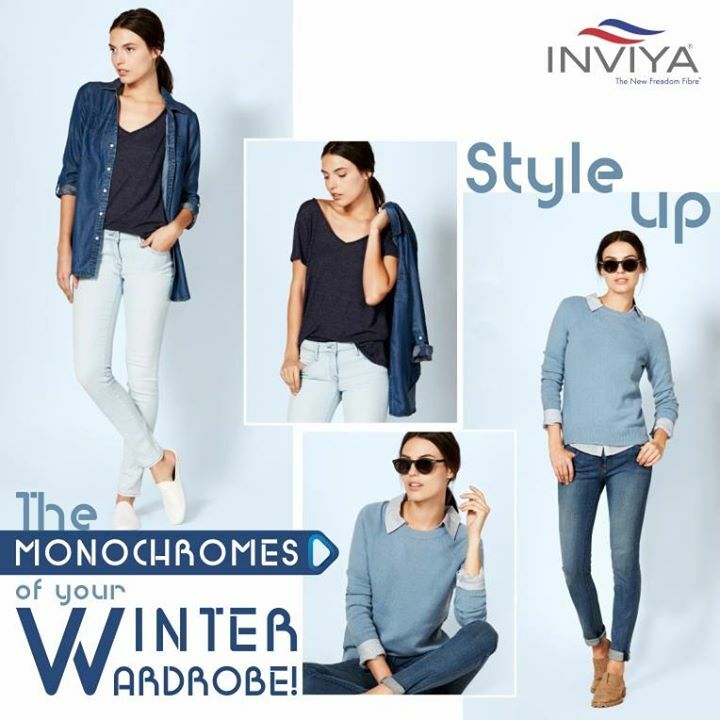 All thanks to the spandex yarn inviya which makes your denims so easy to wear all the time! I personally like flowy dresses for this season for parties or special occasions. Why always stick to cotton and linen? Ditch the regular and go for chiffon and georgette dresses. Fashion experts say, it’s all about changing the fabric, not your fashion statement! As far as colors are concerned I think dark and bright colors are the best for this season. The weather generally remains dark and gloomy in the monsoons. Bright colors compensate for the ambience outside, and bring out a natural balance in our look. Simple accessories add a lot of spark to our otherwise plain and simple outfits. Monsoon is a season where we can play with accessories to accentuate our simple outfits. I often try teaming up plain t shirts and denims with printed scarves. At times I just wrap around my neck, or I just tie it in a loose loop. With just the addition of the scarf, my whole look undergoes a change. Often I spot girls using scarves and every time they stand out the crowd just because of the scarf, and the way they wear it. We can always use a scarf to cover ourselves just in case we get trapped in the rain and we do not have an umbrella or rain coat! Shoes are probably a girl’s main concern while stepping out of the house. The rainy season is famous for creating a lot of problem to the proudly owned shoes of every girl. I do not like wearing crocs everywhere as they do not go with every outfit. I like, and suggest everyone to go for flip flops or bright ballerinas. They are cool, colorful, keep your feet clean and help you wade through water, if necessary. Last but not the least, the one and only essential of the monsoons- umbrella! They are your part and parcel of your entire look during these months. So why not going for bright monochromes or neon umbrellas? Flaunt the colorful umbrellas which would totally match your ensemble. So put aside dull colors and say hello to neon!